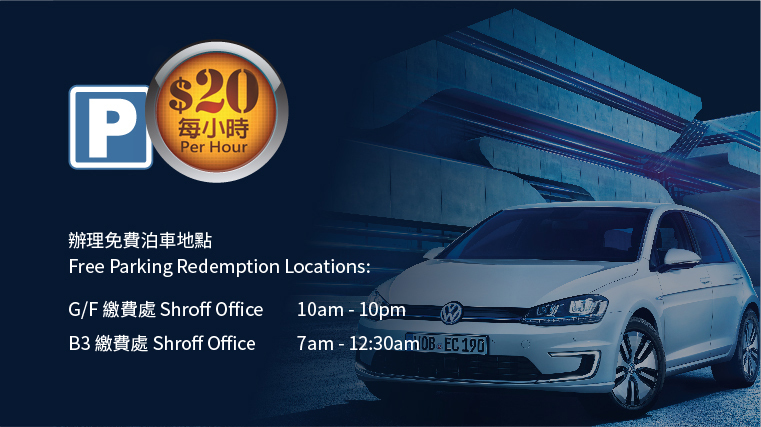 *Valid from 7 am to 12 midnight everyday (based on vehicle park-in time). Some shop tenants only have limited free parking quota. Please enquire with the relevant shop tenant to see if free parking can be offered before committing any purchase or expenditure. *Any Receipts from the Metroplex (including purchase of movie tickets and products, joining of membership of the Metroplex, electronic payment, credit cards and The Snack Bar) are not valid for car park free parking redemption. Electric Vehicle Charging Stations located at B2 Floor, providing a total of 18 changers for public use. Standard (13A) Charger : 4 nos. 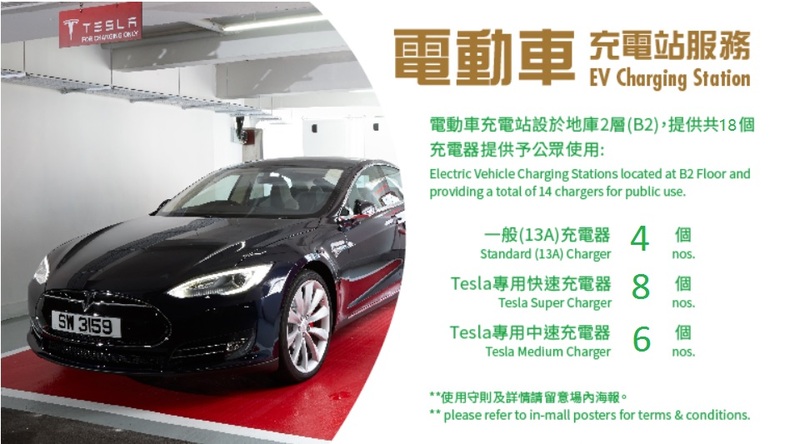 Tesla Super Charger : 8 nos. Tesla Medium Charger : 6 nos. Customers spending a designated amount at E-Max merchants from B3 to 5/F are entitled to this free parking offer. Only original same-day machine-printed sales receipts with merchant name, transaction amount and date are eligible. Handwritten and reprinted receipts are ineligible. 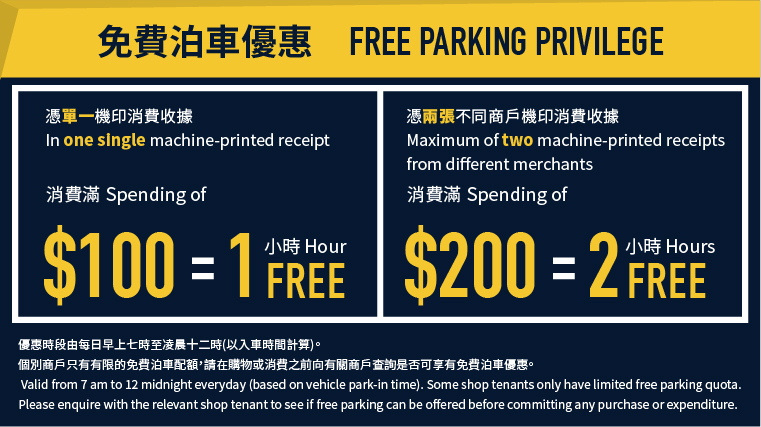 Each parking ticket can enjoy free parking offer once, at a maximum of 2 hours of free parking. Free parking redemption should be made at the Shroff Offices on G/F and B3. Sales receipts will be stamped for verification. Customers shall pay for every additional four parked beyond the free parking hours, the prevailing parking fee will be duly charged onwards. 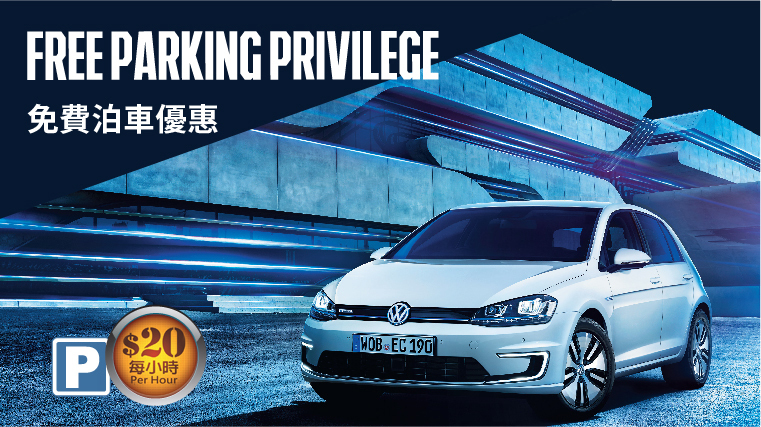 Customers of Kowloon Bay Integrated Auto Mall shall present a copy of car sales contract issued by the car dealer to enjoy this free parking offer. Lost hourly parking ticket. Customers are required to pay all charges resulting from losing ticket according to the carpark regulation. Parking ticket of B1 Loading & Unloading area or any vehicles parked at B1 Loading & Unloading area. Purchase of admission tickets to show and performances (including tickets purchased from Hong Kong Ticketing and Cityline). Receipts of ATM banking machines, receipts issued by exhibitors in exhibition halls, purchase and value-adding of Octopus card or Alipay are ineligible. Receipts of utility bills payment, enrollment fee, membership fee, shopping/dining/gift/cash vouchers or coupons are ineligible. Receipts of temporary exhibition unit or kiosk are ineligible. This free parking offer cannot be used in conjunction with other free parking privileges, vouchers or coupons. KITEC Management Limited reserves the final rights of decision on offering this free parking privilege in case of any doubtful receipts. In case of disputes, the KITEC Management Limited reserves the final rights of decision. KITEC Management Limited reserves the final and absolute right to amend or to terminate the above-mentioned Free parking Privilege anytime without prior notice. 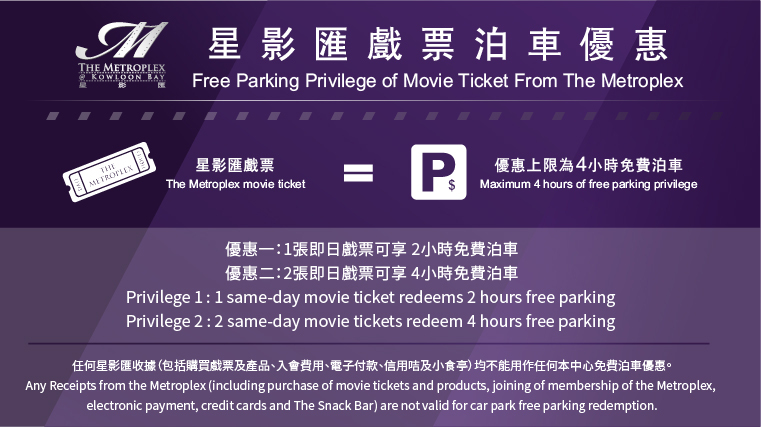 Any handwritten, photocopied or reprinted movie ticket is not accepted for free parking redemption. Free parking redemption should be made at the Shroff offices on G/F or B3 with valid same-day movie ticket. Movie ticket will be stamped by staff of Shroff office for verification. For additional hour parked beyond the free parking hours, the prevailing parking fee will be duly charged onwards. This free parking privilege shall not be used in conjunction with other parking privilege for redemption. Customers lost the hourly parking ticket. Customers also have to pay all charges of losing ticket according to the carpark regulation. Parking ticket at B1 Loading & Unloading area or any vehicle parked at B1 Loading & Unloading area. Each parking ticket can only redeem one time and a maximum of 4-hour free parking. KITEC Management Limited (KML) shall have the authority to withdraw the free parking privilege for any doubtful receipt or invoice. In case of any dispute, the decision of KML shall be final. KML shall have the absolute right to amend or to terminate the above-mentioned free parking privilege anytime without prior notice.